The Sahara edition Wrangler is one of the more popular special editions, because of how it evokes rugged adventure and extreme conditions. If a Jeep can handle the largest hot desert in the world, then surely it can handle the dirt trails and rock faces at home. At Just for Jeeps, we've seen how drivers are passionate about their Jeep Sahara editions, from the unique interior accessories to the distinct badges and logos. But because those parts get worn down or damaged, it's important to have replacements that match the originals. That's where we come in. We offer OEM Mopar's Jeep Sahara tire cover, the same one they install at the factory. It features tan-colored, heavy-duty fabric and an elastic closure to keep it snug on your spare. And it displays the palm tree Sahara edition logo at full size. We're no dealer, however. We work directly with Mopar so that we can offer you discounts dealers won't give. With Just for Jeeps, you can return your Sahara to showroom status for less, leaving more in your wallet for your next adventure. Great spare cover and exactly as described. So glad I made this ourchase. ProsGreat quality and great price. Very pleased. ProsGood quality. Looks great on our green Sahara jeep! This is my 2nd replacement cover on my 1998 Wrangler Sahara. It looks as good as the original and fits perfectly. ProsExcellent quality materials, perfect fit, very reasonable price. We needed to replace our cover which was original to our 2002 vehicle. This is a perfect match and arrived quickly! I have used this site before and always have been happy with the ease of use and fast shipping. The cover I bought showed up quicker than expected. It completes The look of the jeep since I had changed the entire soft top a few months prior so now it's ready to go! So simple to install and looks great! Thanks! Fast Shipping. Perfect Fit. Better in person than in the picture. Overall great purchase. Bought this as a Christmas present for my Jeep Wrangler Sahara. Fits great and looks terrific. 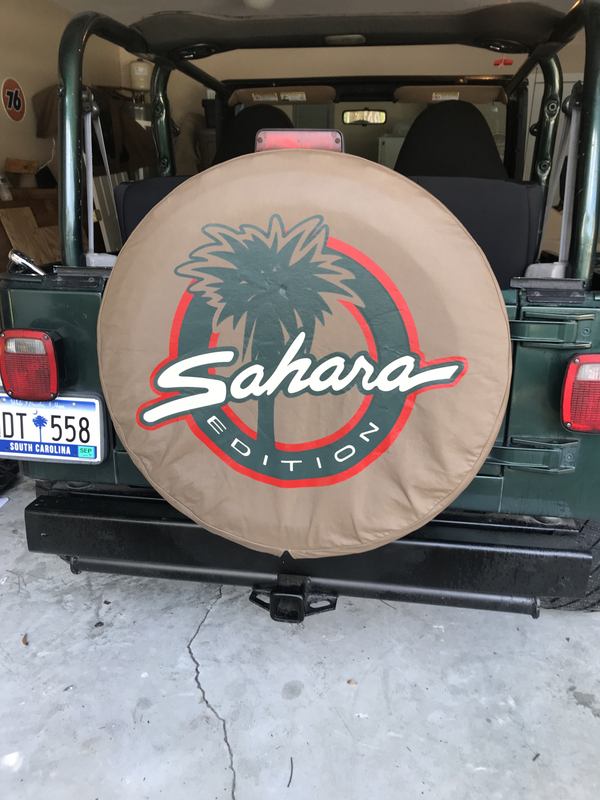 The Sahara tire cover, matched my Jeep Sahara perfectly. The fit is great!! Will order from Just For Jeeps often!! ProsGreat Fit. Great Colors! Great Speedy Shipment! Nice craftsmanship, too big for jeep tire got it for but works great on other jeep and looks nice!